From "James Levine: Celebrating 40 Years at the Met" CD box set. 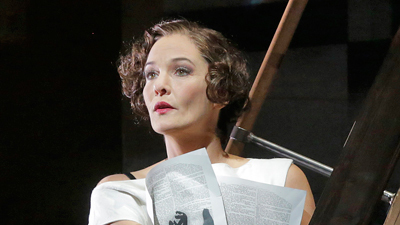 Christine Schäfer sings the title role in Berg’s twelve-tone masterpiece—the femme fatale who so enthralls admirers both male and female that they are powerless to halt their own destruction. Among them are Dr. Schön (James Courtney) and his son Alwa (David Kuebler), the Countess Geschwitz (Hanna Schwarz), the Painter (Clifton Forbis), two princes, an acrobat, and a schoolboy. But the magnetic Lulu is the emotional vortex around which everything revolves—all the way through her own downward spiral, until she is brutally murdered by Jack the Ripper. Maestro James Levine brings unparalleled insight and unexpected lyricism to the score, leading a powerful performance.